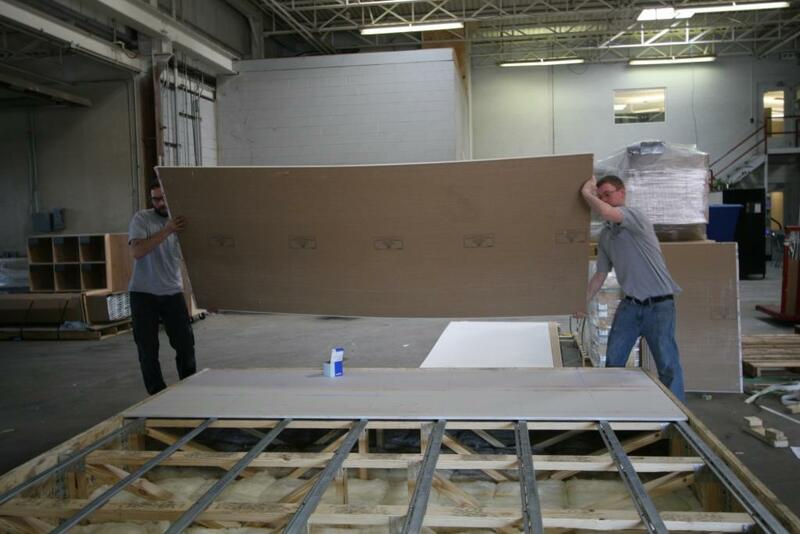 At ECORE, our main factory is located in Lancaster, PA, and we have a second factory and warehouse on the other side of the Conestoga River in York, PA. Not too long ago, Architectural Testing opened a brand new acoustical testing facility just down the road from our York warehouse. 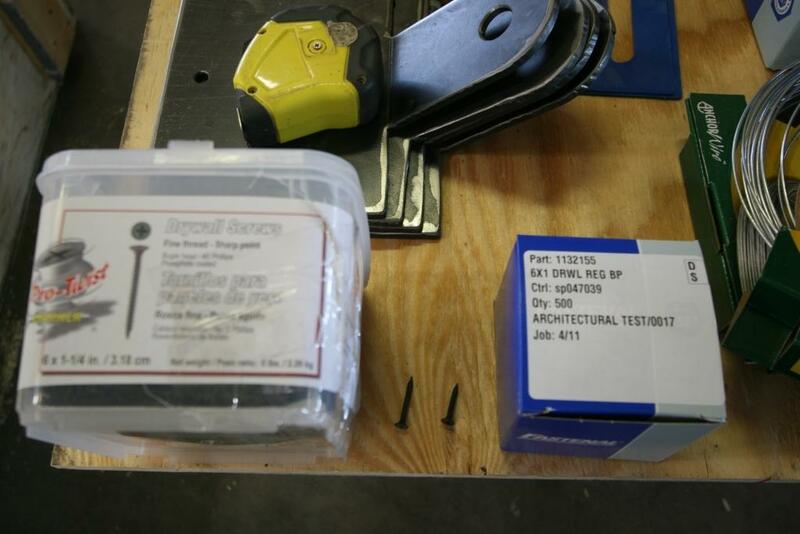 So although we’ve traditionally conducted our testing at NGC Testing Services in Buffalo, NY, we’ve also begun to conduct some tests at this newer, closer facility. It’s been a real convenience in terms of shipping our material and also for ECORE representatives to be on-site to witness the tests. 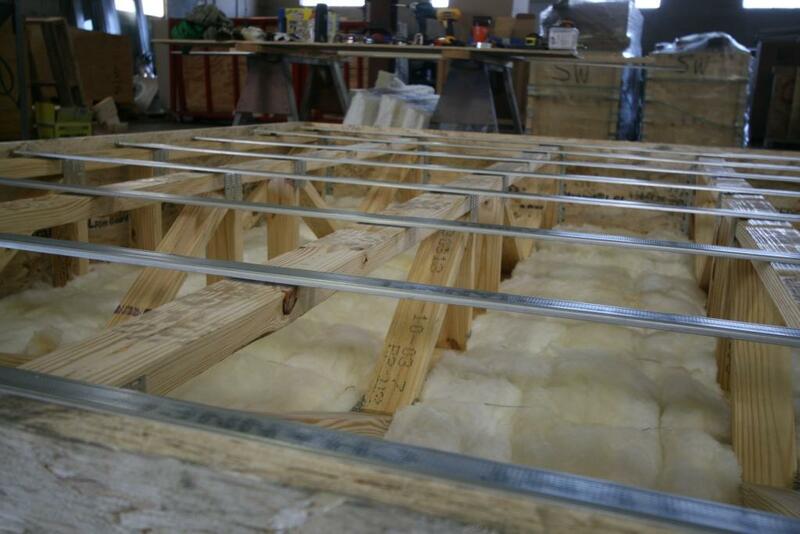 In April 2013, we decided to build a new UL L521 assembly at Architectural Testing to accommodate the many test requests we were receiving involving wood truss assemblies. Since we were investing in having this built at a lab and it would be ours to use for years to come, we wanted to make sure it was done as perfectly as possible. So in addition to poring over the details with the ATI staff, we also brought in a consultant friend of ours, John LoVerde (Veneklasen Associates, Santa Monica, CA) who has a lot of experience with both lab and field tests to help us make sure we addressed every detail of the assembly per the UL description. We were also fortunate enough to get a licensed Hacker gypsum concrete applicator, Al Pollard (Advanced Flooring) make the trek out from New Jersey to pour the gypsum underlayment for us. I won’t go into the details too much, but the different parts of the assembly are detailed below along with some photos so you can see what the 3-day process was like (check out those STC ratings!). Complete details of the UL L521 assembly may be found here. 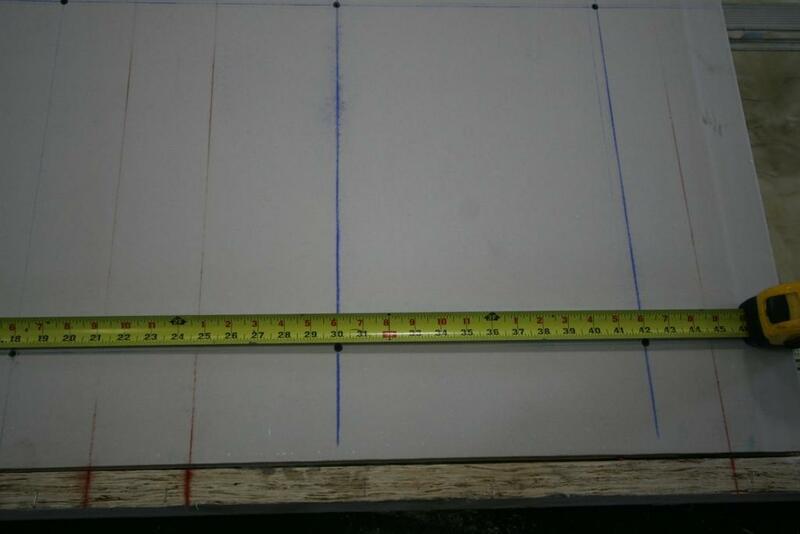 Flooring System: Subflooring—Nom 23/32 in. thick wood structural panels installed perpendicular to trusses with end joints staggered. 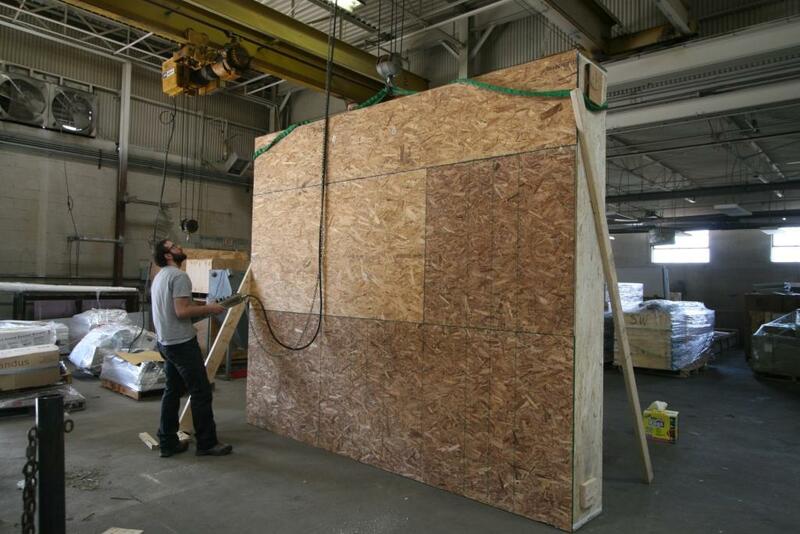 Plywood or panels secured to trusses with construction adhesive and No. 6d ringed shank nails, spaced 12 in. OC along each truss. 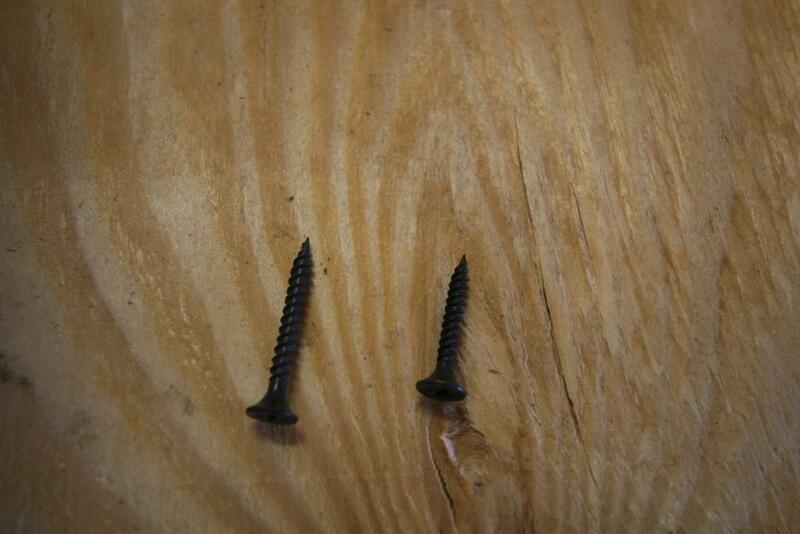 Staples having equal or greater withdrawal and lateral resistance strength may be substituted for the 6d nails. Vapor Barrier (optional). Floor Mat Materials (Optional). Trusses: Parallel chord trusses, spaced a max of 24 in. OC, fabricated from nom 2 by 4 lumber, with lumber oriented vertically or horizontally. Min truss depth is 12 in. when no Ceiling Damper* is used and 18 in. when a Ceiling Damper* is used. 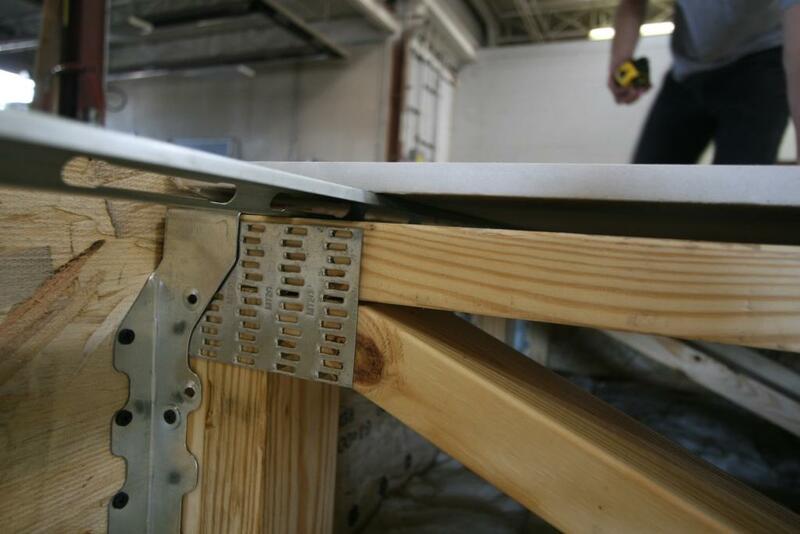 Truss members secured together with min 0.0356 in. thick galv steel plates. Plates have 5/16 in. long teeth projecting perpendicular to the plane of the plate. The teeth are in pairs facing each other (made by the same punch), forming a split tooth type plate. Each tooth has a chisel point on its outside edge. These points are diagonally opposite each other for each pair. The top half of each tooth has a twist for stiffness. The pairs are repeated on approx. 7/8 in. centers with four rows of teeth per inch of plate width. 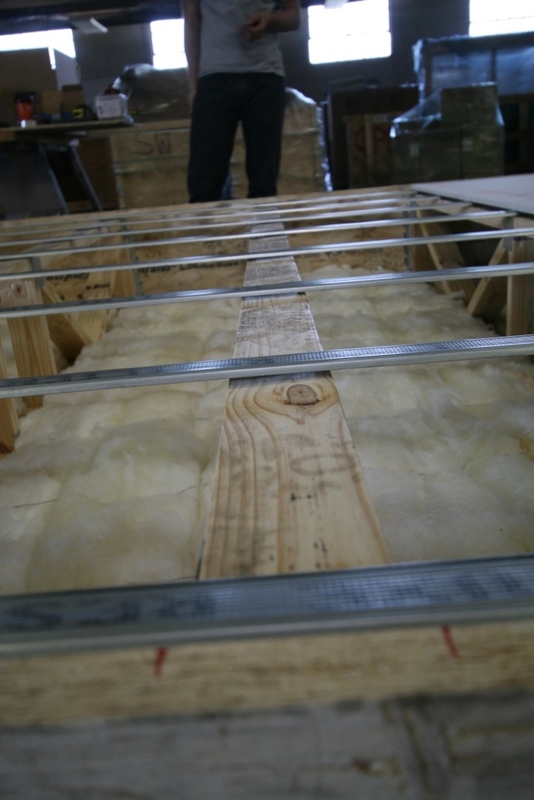 Batts and Blankets (Optional): Glass fiber or mineral wool insulation bearing the UL Classification Marking as to Surface Burning Characteristics and/or Fire Resistance. 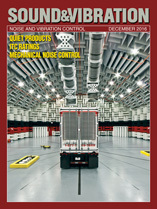 When the resilient channels (Item 6) or furring channels (Item 6A) are spaced 16 in. OC, the insulation shall be a max of 3-1/2 in. 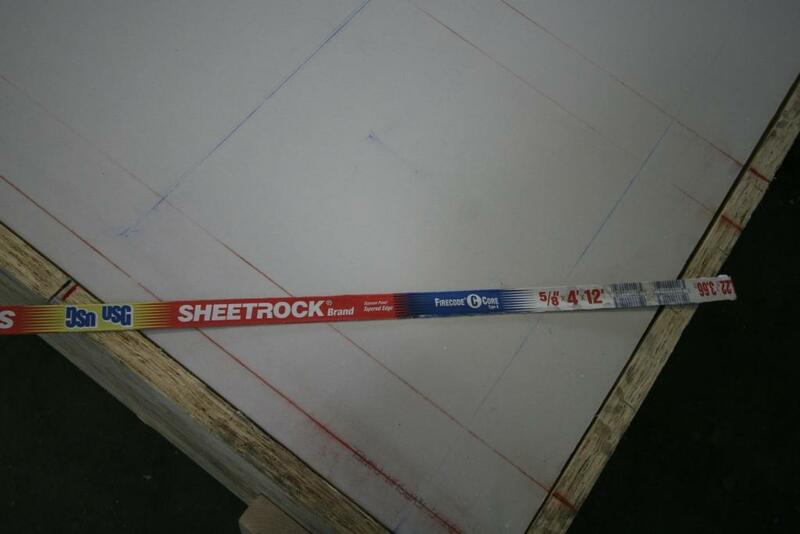 thick, and shall be … held suspended in the concealed space with 0.090 in. 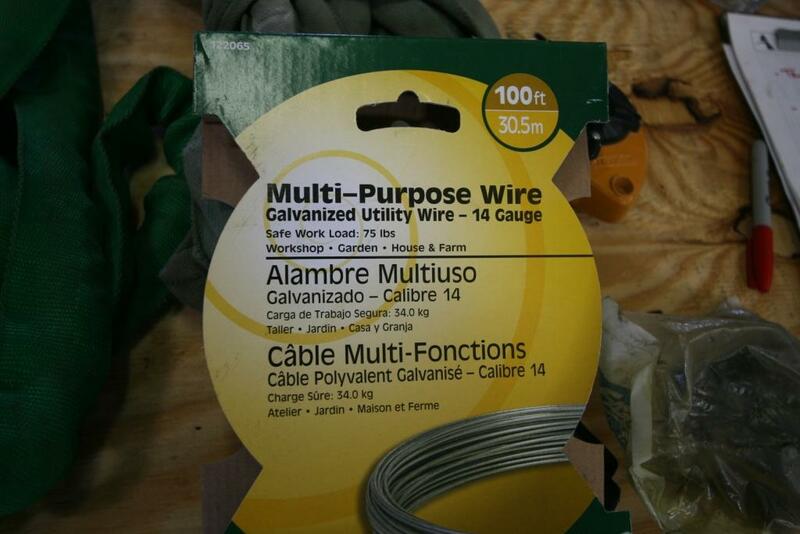 diam galv steel wires attached to the wood trusses at 12 in. OC. 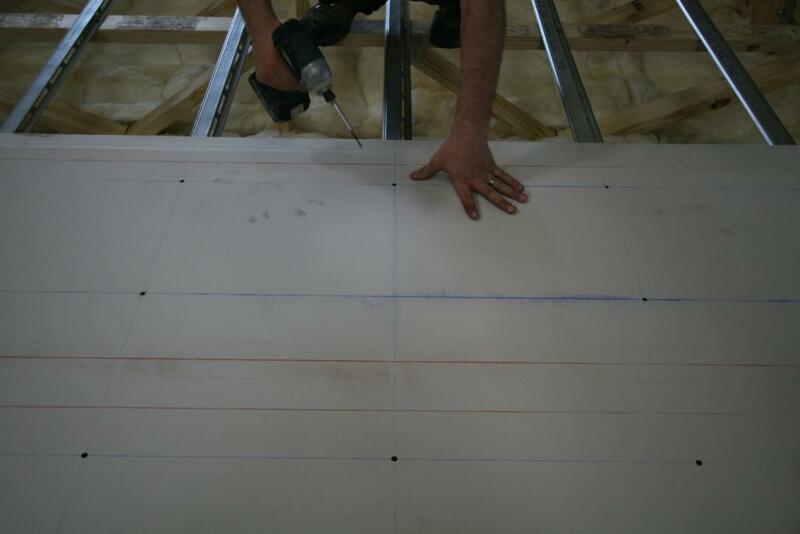 Resilient Channels: Formed from min 25 MSG galv steel installed perpendicular to trusses. 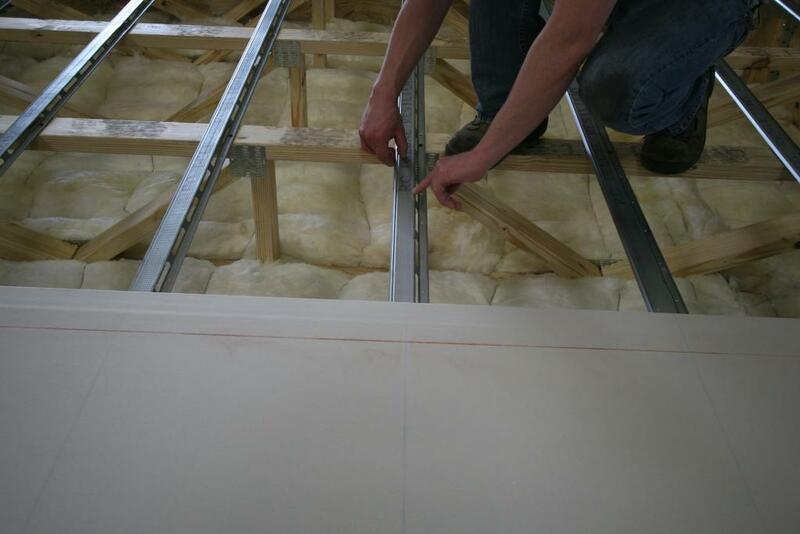 When insulation , Item 5 is secured to the underside of the subfloor the resilient channels are spaced 16 in. OC. Channels secured to each truss with 1-1/4 in. long Type S bugle head steel screws. 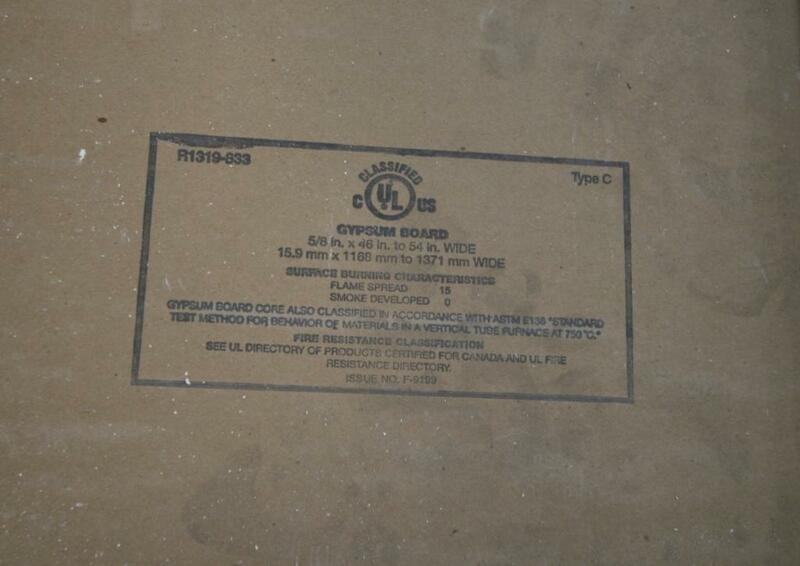 Gypsum Board: Nom 5/8 in. thick, 48 in. 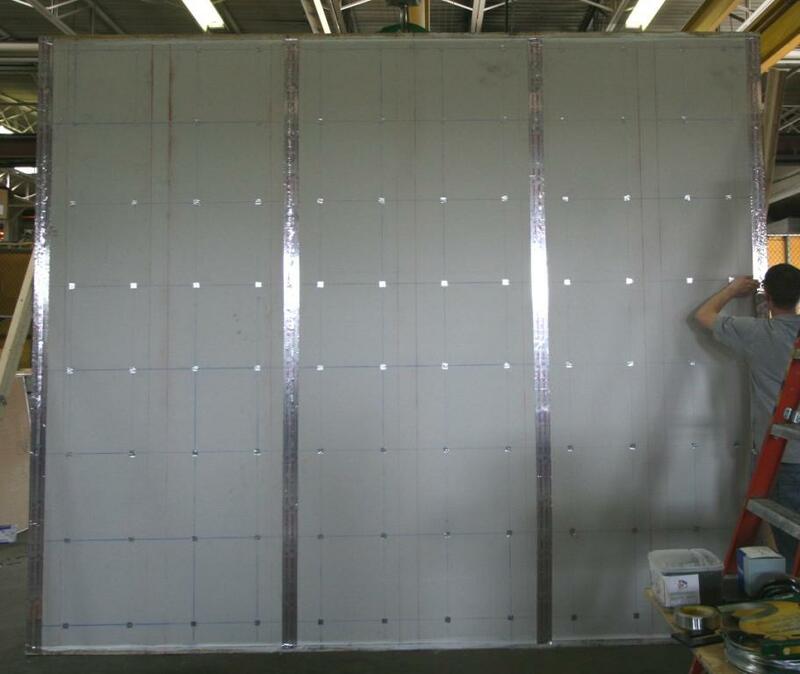 wide gypsum panels. 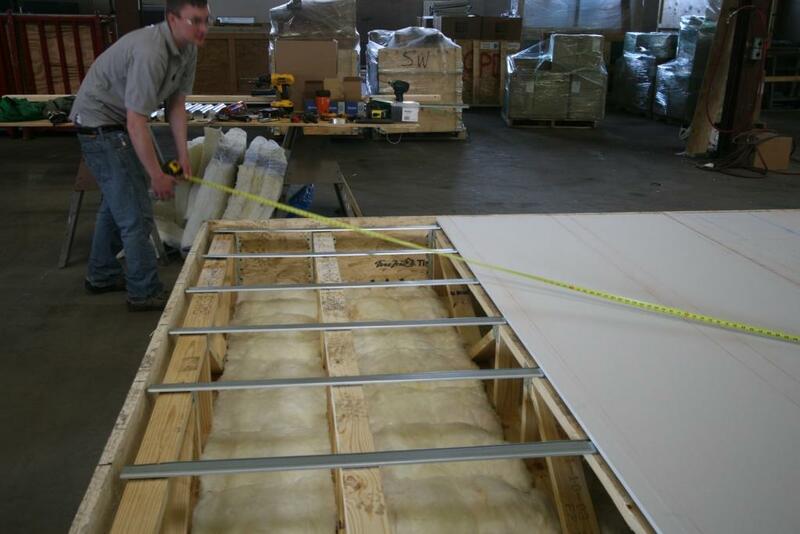 When resilient channels (Item 6) are used, gypsum panels installed with long dimension perpendicular to resilient channels. 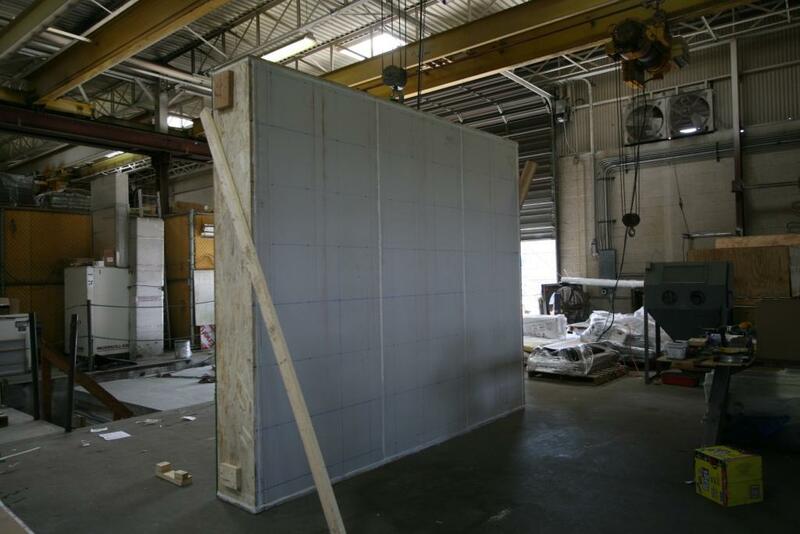 Gypsum panels secured with 1 in. long Type S bugle head steel screws spaced 12 in. OC and located a min of 1/2 in. from side joints and 3 in. from the end joints. 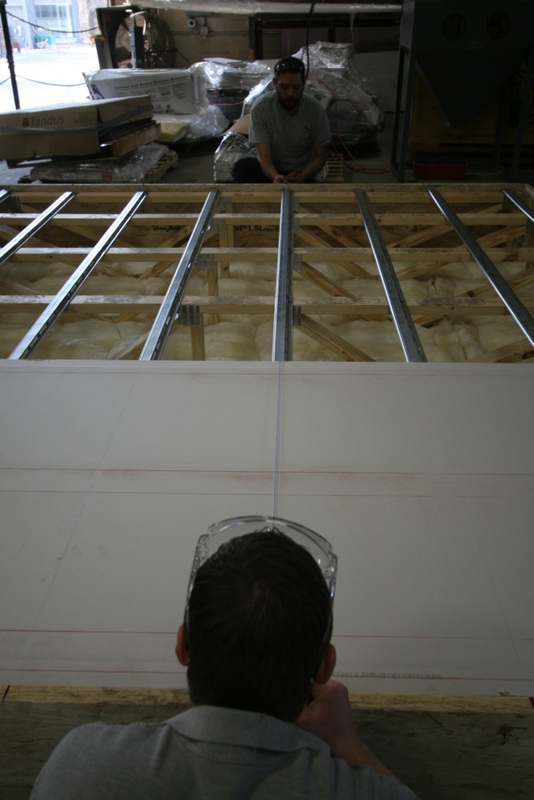 Finishing System: (Not shown) – Vinyl, dry or premixed joint compound, applied in two coats to joints and screw-heads. Nom 2 in. 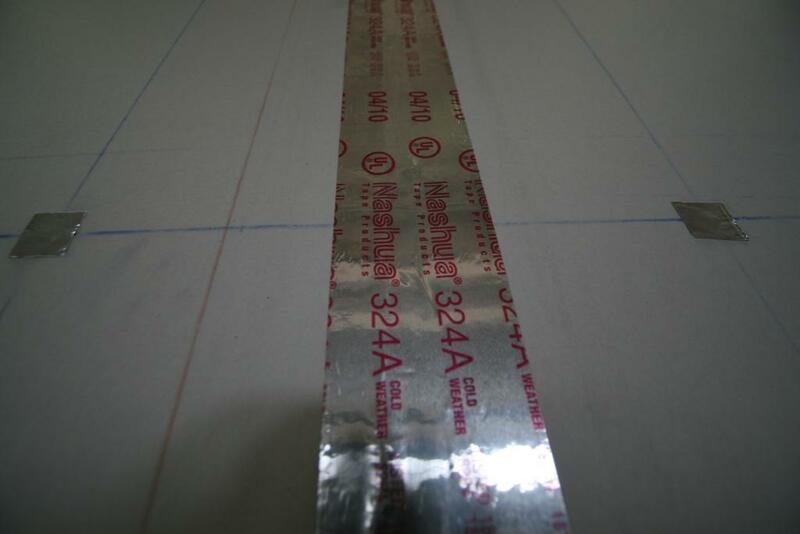 wide paper tape embedded in first layer of compound over all joints. As an alternate, nom 3/32 in. 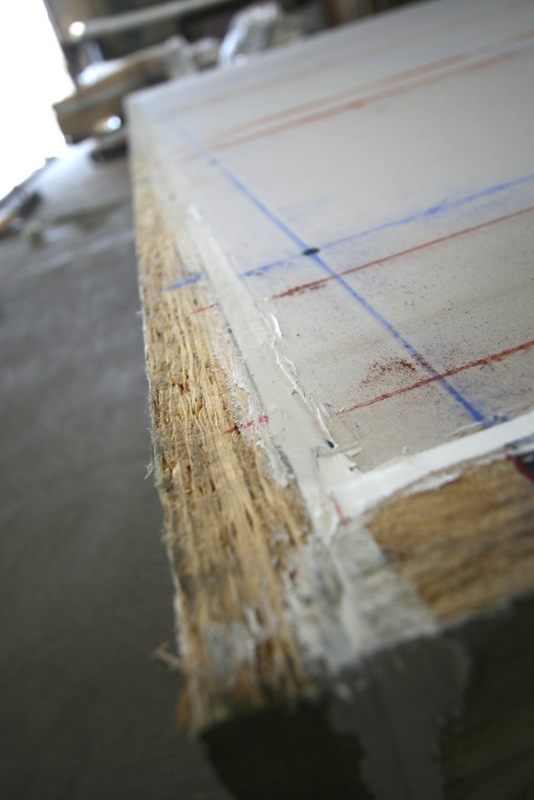 thick veneer plaster may be applied to the entire surface of gypsum board.